Nathalie Applewhite shared her experiences abroad with students. 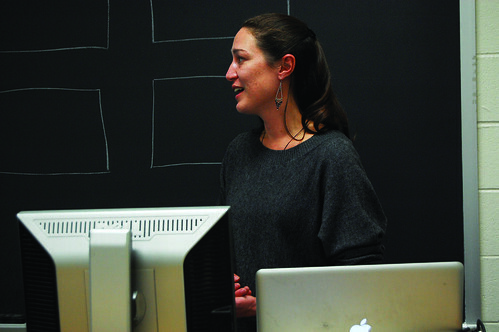 ABIGAIL REIMOLD TTN Nathalie Applewhite speaks to students in Renee Hobbs’ Mass Media and the Children class in Annenberg Hall. Applewhite is a 1996 Temple graduate and was the first student to complete a degree in visual anthropology. The approximate number of women who die each year from issues related to pregnancy and childbirth is 342,900, according to the Pulitzer Center on Crisis Reporting. Approximately 2.6 billion people in the developing world do not have access to functioning toilets. More than a billion people use unsafe water. Issues surrounding these statistics are affecting large numbers of the world’s population and yet, they are largely ignored by the American media. Nathalie Applewhite, the managing director of the center and a Temple alumna, is trying to change that. Applewhite returned to Temple as a guest speaker for the Mass Media and the Children class, taught by professor Renee Hobbs in Annenberg Hall. Applewhite spoke about the Pulitzer Center and how she obtained her dream job with the organization. While at Temple, Applewhite was the university’s first undergraduate visual anthropology major, which focuses on ethnographic film and the way various groups are represented or represent themselves through the media. “I chose visual anthropology because it allowed me to explore all of my interests,” Applewhite said. Applewhite earned her undergraduate degree in seven years – she attended another university in New York City for a year, studied abroad in France prior to enrolling at Temple and transferred to Temple for four years. While at Temple, she participated in the Latin American spring semester program and spent two semesters at Temple Japan. Applewhite said while her frequent traveling may not have been the best choice economically, it helped her explore all of her interests and make some realizations about American news. It was these observations that eventually led Applewhite to create the documentary, “Picture Me An Enemy.” The film tells the stories of two women from Bosnia and Croatia who point out the misrepresentation from American media portrayals of the conflicts in their native countries. Applewhite and her partner, René Lego, created the film after the war in Bosnia ended without any money to use for the film’s production. One of the women in the film, Tahija Vikalo, invited them to her home in Bosnia to do some filming. Back in the United States, they worked on the project nights and weekends while they weren’t busy with their full-time jobs. “Picture Me An Enemy” took four years to create and was nominated for a Mid-Atlantic Emmy in 2003. Applewhite went on to graduate with a degree in international affairs from Columbia University. While there, she participated in a citizen’s exchange program in Syria. She said her experience helped cultivate her awareness of the various problems in the U.S. news cycle. She took a job at the Pulitzer Center in 2006 when the organization was only two-people strong. The Pulitzer Center on Crisis Reporting draws from Applewhite’s interests of improving the quality of international reporting by offering grants to qualified journalists who seek to report untold stories. The Pulitzer Center’s focus on education helps to ensure there will always be plenty of consumers of news interested enough to read the stories people like Applewhite are trying to tell. “I got lucky [getting my dream job] because I followed what I believe in,” Applewhite said.